It combined text, music, and stunning projected video and images to explore the world of the artisans: the papermakers, violin carvers, string spinners, and the performers who helped J.S. Bach realize his musical genius. The work is set in Leipzig, a center of trade in the 18th century and home to Bach for the last 27 years of his life. Last evening’s audience was transported to the churches, the university and to one of the Friday night coffee houses of Bach’s day to listen to the instrumentalists. The show gave a wonderful impression of Bach’s life in the city. Blair Williams of the Shaw Festival narrated a cohesive script that tied together the music and images. Many of those images were the result of a collaboration with the Bach Museum in Leipzig, Germany. 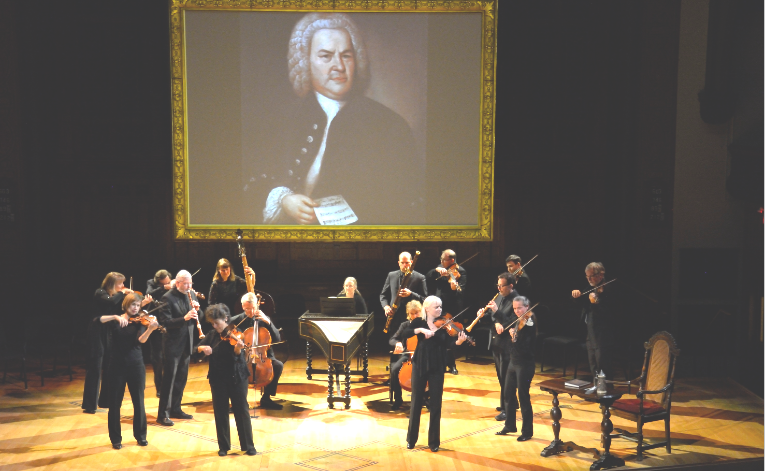 The orchestra, led by violinist Christopher Verrette, performed some of Bach’s most recognizable works and included the Sinfonia to Cantata 249a, which opened the concert, and two movements of the Brandenburg Concerto no. 3 in G Major BWV 1048. As exciting as the ensemble music was, it was the energy and purity of the solo playing of several in the orchestra that elevated the program to the level for which that this world-renowned ensemble is famous. This mini-tour to a few of Ontario’s smaller centers wraps up in London this week. It is a tribute to the members of Tafelmusik that they play as enthusiastically in a church in Port Perry, as they do on the major stages of the world. The audience in Port Perry certainly thought so. “SHREK, The Musical” – fairy tales…I’m a believer!